On October 6th, Engaging the Senses Foundation (ETSF), in partnership with the California Arts Council, and the Los Angeles Department of Cultural Affairs/McGroarty Arts Center is sponsoring a coming-together event of current and former California local poets laureate in a celebration of the power of poetry on and off the page to nourish our deepest humanity. 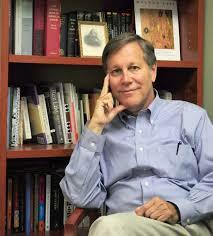 The gathering is the brainchild of current CA state Poet Laureate Dana Gioia, who is featured in our documentary-in-production Be the Beauty. Dana is an award-winning poet, author of the seminal critique Can Poetry Matter?, and a recipient of the 2014 Aiken-Taylor Award for lifetime achievement in American poetry. He was also the Chairman of the National Endowment for the Arts (NEA) from 2003-2008, where he created enduring art programs such as Poetry Out Loud. Dana’s desire to serve the underserved has informed all of the programs he has created on the federal and state level, which are consistently inclusive, with a focused yet broad outreach (for instance, as CA Poet Laureate he has visited every single district over the last two years, the first laureate ever to do so). His dedication to this vision mirrors ETSF’s commitment to vibrant inclusivity. We believe that the difference these kinds of programs make to communities — and to the individuals within these communities who have the opportunity through them to being seen, heard, and valued — cannot be overstated. This is why we will be filming the event, so that its impact can reach as far as possible. The day-long occasion will take place in the former residence of John McGroarty, California’s third poet laureate. Several of the poets laureate will moderate breakout sessions early in the day, in which all the poets attending will share best practices and lessons from their experiences as representatives of literacy appointed by their cities, counties, regions, and the state. Along with all the regional poets laureate, Dana Gioia; Robin Coste Lewis, Los Angeles Poet Laureate; and Carol Muske-Dukes and Al Young, both former California Poets Laureate, will then take part in a group reading open to the public. This is a thrilling time for the art of poetry in the US. During a time of unprecedented turmoil and struggle in the public realm, people young and old are discovering the enduring value of turning to art to express and share their experience of life in the 21st century America. 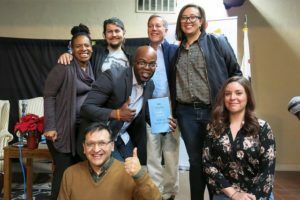 According to a comprehensive report by the NEA, poetry readership in the U.S. has risen by 76 percent in the past five years, with a new audience that is young and diverse, and increased participation and readership among Hispanic, African-American, and Asian readers. ETSF is committed to supporting this trend by working with organizations like the Native Arts and Cultures Foundation, CUNY’s Lost & Found, and the foster care home Five Acres, to help bring poetry to underserved communities in the belief that it is an art form designed to heal and potentiate on both an individual and community level. It’s our hope that this gathering of creatives can become a model for other state’s partnerships. We are proud to continue fulfilling our mandate by honoring the dedicated men and women who have committed their time and energy to championing literacy in their communities. After the working sessions, poets, teachers, and all poetry lovers are invited to attend on Saturday afternoon for what will surely prove to be a powerful and historic group reading. We urge you to come so you can listen to, meet, and celebrate California’s vital public poets laureate! To register for this free public event.